Peel and halve the pears, removing the seeds and core. Cook in the sugar syrup for 5 to 10 minutes, depending on how ripe they are. 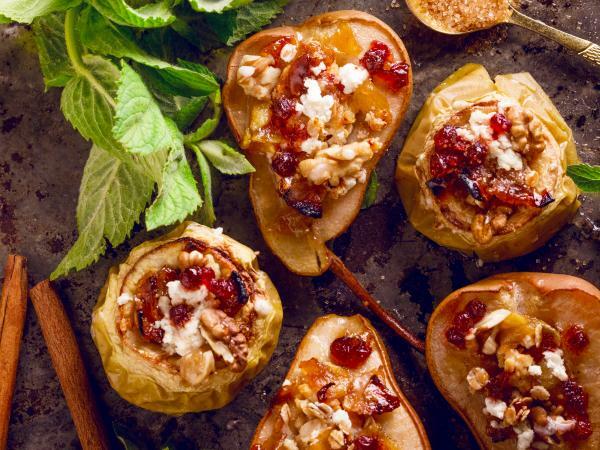 Place the pear halves on a baking tray, cut side up, sprinkle them with raw cane sugar and drizzle with honey. Bake in a preheated oven for 5 minutes at 180°C, pour the Valais Williams pear brandy AOP and Malvoisie into the baking tray and let caramelise. Whisk the goats’ cheese and chestnut purée together until smooth, then place in a piping bag with a flat nozzle. Pipe the filling into the pear halves and pour over the caramelised dressing.